Over the next few days it is crucial that we fight, and fight, and fight again, to save the party we have loved for the last 10 months! A BRITISH political party, founded over 100 years ago by socialists has been 'infiltrated by socialists', it has been claimed. 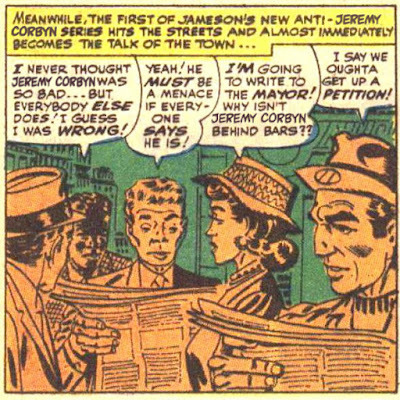 The Labour Party, started in 1900 by self-confessed socialist Keir Hardie, has seen a 'suspiciously large influx' of people who believe a lot of the same things as he did. A senior Labour official said: "These people are clearly very interested in politics, but for some reason they haven’t joined the Conservative Party. It would appear they are really into redistribution of wealth, nationalisation and the welfare state. It’s all very sinister." Jane Thompson, who joined the Labour Party recently, said: "At first I double-checked to make sure I wasn’t an MI5 agent. "I’m pretty sure I’m not, though MI5 can do all kinds of weird things. Anyway, the most likely explanation is that I now believe the Labour Party could potentially do things with which I actually agree. And there you have it. The whole thing. The whole argument laid out in black and white. On one side, people who think it is ridiculous that people have strong convictions about a party they have only recently joined. On the other side, people who think it is ridiculous that they are being called communists (and worse) for holding perfectly mainstream socialist views. One side quite sure that socialism is going to destroy the party; the other side unable see any point in the party carrying on if it isn’t mostly socialist. The Maomentum joke invokes the spirit of Hugh Gaitskill, who told the 1960 Labour party conference that he would fight, fight and fight again to save the party he loved. The party he loved had just voted against Britain having its own weapons of mass destruction which he thought (and I paraphrase here) made them unelectable. Granted, the issue of WMDs is one that can cut across left/right divisions: Nye Bevan, famous non-nudist and socialist saint, ended up in favor of them. But still: the quote that’s being invoked is about saving the party from socialism. Or at any rate, from too much socialism. Momentum is an internal pressure group which supports Jeremy Corbyn’s leadership; Mao Zedong was a Chinese Communist who believed that peasants were the vanguard of any revolution. The point of calling the feed Mao-mentum is to imply that supporters of Jeremy Corbyn are Maoists. I don't think it is possible to be a Maoist and a Trotskyite at the same time. 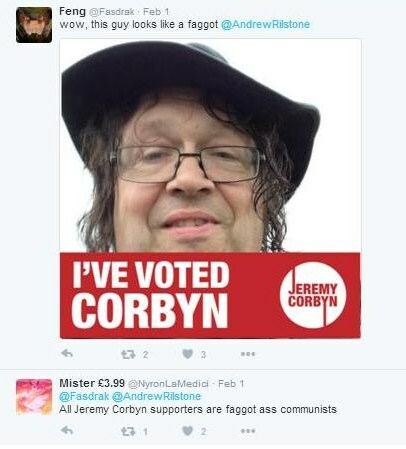 But supporters of Anyone But Corbyn throw words like Maoist, Communist and Trotskyite at anyone slightly to the left of them. It's a bit like a Church where people say “You damn Calvinist!” and “You bloody Papist!” as if they came to the same thing. When I complained to one of my traditional Labour friends about their use of the word Trot to describe anyone to the left of them, they pointed out that I sometimes use the word Blairite to describe people to the right of me. Has it really come to that? Is insinuating that a comrade is secretly working towards world communist revolution really as bad as insinuating that a comrade supported the last Labour prime minister but one? Some of my Labour friends really did support Tony Blair but I never even met Leon Trotsky and shouldn't think I would have liked him very much if I had. The real equivalent of calling a Corbynist a Trot would surely be calling an Anyone-But-Corbynist a Stalinist. For the avoidance of doubt: I mean that both insults would be equally silly. I paid £3, according to party rules, to become a registered supporter of the Labour Party and cast my vote in the last leadership election. When Jeremy Corbyn was elected leader – in that very hour – I became a full member of the party, for something like £60 a year. 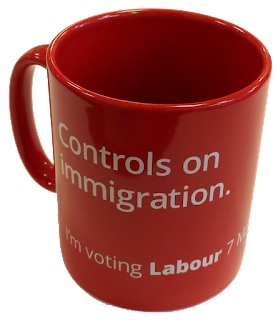 I admit that I saw joining Labour in the much the same spirit as joining Amnesty or joining Liberty or joining the Bob Dylan fan club. I was indicating my support for a particular programme, committing some money to the cause, promising to vote with the party in elections; and lending them a little extra "clout". In return, I expected to get some information, preferential booking at concerts, a membership card and secret code book. Tens of thousands of us joined in the same spirit, giving the party a not insignificant financial boost. I grok that, since hardly any of those ten thousand came to meetings or volunteered to do electiony things during the election, the Stalinists long-term activists find it very hard to think of us as actually having joined anything at all. Someone said that it was hardly fair that someone who joined a party yesterday should have the same say in choosing a leader as someone who has been pushing leaflets through doors for the last twenty-five years. I agree. So why do the rules say one member one vote rather than one activist one vote? I believe that if I wanted to become a Quaker, I would simply start attending Meetings. After a certain amount of time, someone would approach me and ask if I wished to become a member of the Society. Not the other way round. My background is Labour; some of my earliest memories involve my parents running Labour campaigns from our front room. My grandparents where party activists. Tony Benn famously said that the Labour Party owed more to Methodism than to Marx: I was raised Methodist. I feel an emotional connection with the Left that I don't feel with other secular causes. I know I ought to care very much about environmental issues and human rights issues and freedom of speech issues. I still don't really understand what fracking is, but I am quite clear that I am against it. But I don’t feel it in my heart. But talk to me about the Tolpuddle martyrs or Mrs Thatcher and the Nottingham miners or Jeremy Hunt and the junior doctors and I'll become emotionally engaged. There is power, there is power in a band of working folk, and all that that entails. I was really quite proud and excited when we Librarians went on strike for a whole day last year. I supported Labour 1987 and 1992. The '82 election was a month before my 18th birthday. But by 1993 I had formed the opinion that John Smith's shadow Home Secretary was a swivel-eyed lunatic (because of his political exploitation of the grotesque James Bulger murder). When Smith suddenly died in 1994, I said the the cleverest thing I have ever said in my life. "Oh God, please, anyone but Tony Blair." For the next 20 years I switched between voting Liberal, Green, various flavours of Independent and not bothering to vote at all. I watched with some amusement as Tony Blair's name became a slur and an insult even inside the party in the name of which he had single-handedly won three elections, and tried terribly hard not to say "I told you so". I said that it would take a Clause 4 moment to convince me that Labour was no-longer the party of the Warmonger. When that moment unexpectedly came I posted off my membership fee. Earlier this year we had elections for the local council and the Mayor of Bristol. For the first time in my life, I felt I was voting for a party that I really believed in and which had a real shot at winning. I don’t understand what it would mean to love a political party, any more than I understand what it would mean to love a refrigerator or a wellington boot. There are people who really like doing politics: who think that door knocking and leafleting and standing outside cold polling stations is almost as much fun as waiting on railway stations for a train number you haven’t seen before. There are people who really like doing church: running sales of work and arranging flowers and colouring in pictures of Zacheus the tax collector in crayon. And there are people who really don’t. Saintly people like C.S Lewis say “Aha, the very fact that I don't like church proves that going to church is the pious thing for me to do. Doubtless God invented it to challenge my intellectual pride." The less saintly of us find that we can't quite remember the last time our bottom had contact with a pew. But surely, those of us who don't regard putting leaflets through doors as the most fun a young Trotskyite could have on a wet Sunday afternoon are still entitled to some input into the political process? I do sometimes wonder if perhaps political parties are maybe just a little bit too obsessed with leaflets. You have no idea how many came through my door during the Referendum. I wonder what difference they made? Certainly no-one reads a slogan about how many millions of pounds the E.U wastes on banana straightening devices; or indeed, how many pretty babies the Liberal candidate has, and says "Very good point! I shall shift my allegiance forthwith!" You may say that I am disengaged from real politics because I only read about it in the newspaper and write about it on the internet, if you want to. You may call what I do "clicktivism" if you like. Vladimir Ilyich Ulyanov started his career publishing a fanzine called Pravda which I believe is still going. Maybe if he'd done it on a blog it wouldn't have counted. 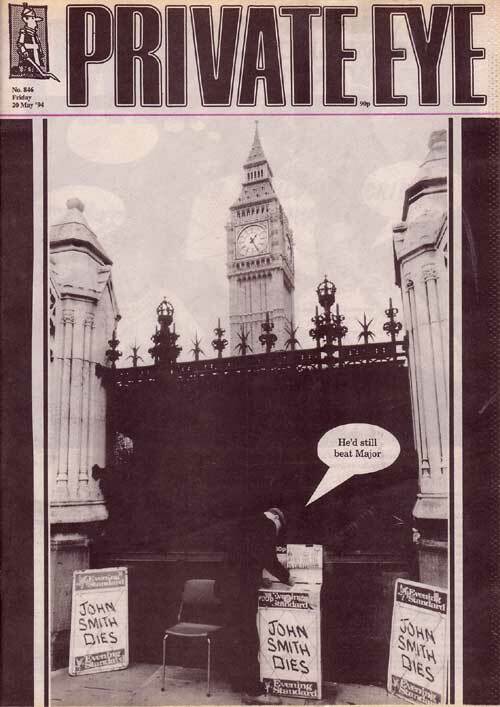 Some time ago I was approached by a nice young man selling copies of a magazine called The Socialist. He said that it used to be called Militant. The Militant group, he explained, had once been part of the Labour Party, but they decided to leave in the 1980s because the party had become too right wing for them. I must admit that this is not exactly how I remember it happening. When I told this story to my Communist friend he said "But that's the whole trouble with the Left. In an internet age, they are still standing outside railway stations trying to sell newspapers." What is a middle-aged Trotskyite to do? I can sign up to the Labour party, as a £3 supporter, a £25 supporter, as full member, and vote for the leadership candidate who believes in the things I believe in. But this, say the Stalinists activists is entryism: I am not a real member and Corbyn is not a real leader. Some of them will go so far as to call me a cancer that needs to be cut out or an infestation which needs to be cured. OK, then: I can become an activist myself: go to my local party meetings and volunteer for committees, argue for socialist policies; nominate socialist conference delegates and above all try to ensure that there is a socialist candidate standing at the next election. But this makes me, in the eyes of the Stalinists moderates the very devil. Reselection is the great taboo. I think I understand some of the bitterness. The fear is that 150,000 new members will turn up at the little hall where you've been having meetings for the past fifty years and announce that because Mrs Miggins doesn't support unilateral disarmament vociferously enough she will henceforth be relieved of her tea-making duties. I tried to explain this to my Apolitical friend. "I don’t see the problem" he said "Of course someone shouldn’t automatically be able to remain an MP for life if members of their party don't agree with them any more." So then, I shall go away and start my own Trotskyite party; or give my vote to the Greens, or to Respect or to some worthy independent. But the Stalinists Labour loyalists will come to me in 2020 and say "It is self indulgent to waste your vote on a party of protest. The Greens and the Liberals and Respect are free to say whatever they like, content in the knowledge they will never have to implement their promises." Some go so far as to say that the UK is irreducibly a two-party system and it is almost undemocratic to vote for someone who isn't one of the two main parties. So for me the choice is Corbyn or nothing. My MP, Thagam Debbonaire has published an open letter which credibly accuses Jeremy Corbyn of (at the very least) catastrophic managerial incompetence since he became Leader of the Opposition. This puts some meat on the bones of the "unelectable, unelectable, unelectable" mantra. Please read it. Some of Ms Debbonaire's arguments I find a little weak: Corbyn's position, that the government should honour the result of the referendum and withdraw from Europe (even though he personally favoured staying) is highly consistent with his belief in democratic mandates. The fact that the majority of people in Bristol voted Remain is neither here nor there. And I fear that "I want a Labour Government more than anything" is meaningless. I don't want a Labour Government on any terms: not one which get into bed with Donald Trump, bring back hanging, or make people pay to see their doctor. "Oh, but that could never happen." No: no it couldn't. And yet the Iraq war happened: and water is privatized and students have to pay to go to university. The letter is refreshingly free from words like Trot and leftie and communist and I am sorry if I associated myself with people who were using words like traitor and turncoat when Thangam resigned from the shadow cabinet. The claim that Corbyn is incompetent is serious and important. "The reason I voted 'no confidence' in him as leader is because I have no confidence in him as leader" she writes. You can't put it much more clearly or fairly than that. But although this letter has helped me understand why some people support Anyone But Corbyn it hasn't persuaded me to change my position. Back in August 2015, Alastair Campbell told Labour voters to support Anyone But Corbyn in the first leadership election ("no first preferences, no second preferences, no any preferences") because he would be a leader "of the hard left, for the hard left" and would therefore be unelectable. In September, Roy Hattersley wrote in the Guardian that "half the Labour party is deeply opposed to (Corbyn's) policies" (*) and that before an election can be won there would have to be "a formal and public renunciation of many of the policies on which the leadership election was won." Again, it was the policies he appeared to have the problem with. Tony Blair affected not understand how anyone could support a Corbyn because, look we all yes agree that y'know socialism is yes wrong. I do not say that the complaints about incompetence are untrue. I do not say that they are not deeply felt and sincere. Clearly, our man Could Do Better in some respects. But they are not what this is about. This is about politics. Before I nailed my colours to this particular mast I had not understood the visceral, gut level hatred that some on the Right feel towards what I would call Socialists and what they would call Trots. I don’t know whether, like Mrs Thatcher, like Melanie Philips and indeed like my Fascist friend J.C Wright they honestly believe that Jeremy Corbyn and John Smith and Billy Bragg and me are part of a literal Communist plot to bring about the end of civilization or if it is simply rancor about the 1980s and Militant and the SDP and Tony Benn. (Roy Hattersley talks about the guy running Momentum as having been one of Tony Benn's "henchmen". I didn't know that National Treasures had henchmen. Do they have secret underwater bases and bat signals as well?) I am inclined to think that Corbyn could abolish poverty and bring peace to the middle-east and some of the older Labour Party members would still be unable to forgive him for being a founder member of the Campaign for Labour Party Democracy. I do not hear any voices in the Anyone But Corbyn camp saying “We like Corbyn. We like his clarity, his authenticity, even (in a funny) way, his charisma. We like the fact that he can pack out halls and that tents full of hippies cheer the mention of his name. We (subject to the normal disagreements which all politicians have with all other politicians) agree with Jeremy. We want what Jeremy wants. But — here’s the hitch — we’re not convinced by his managerial abilities. We don't think he's up to handling the day to day running of a party and eventually a Prime Minister's office. What we want is for Jeremy to carry on touring the country making speeches, firing people up about socialism and the new politics, but for someone else to be actual Leader of the Opposition." What I have heard, from the beginning, is the chant "unelectable, unelectable, unelectable." And frankly, it is worth twenty five quid of anyone's money for even a small chance of the newspapers having to print headlines which say UNELECTABLE MAN ELECTED in 2020. When they say he's unelectable, what they mean is "he's a socialist". That was clearly the opinion of Campell and Blair and Hattersley from the very beginning. He's unelectable because he's a socialist; socialists are unelectable because The People never elect socialists. If we concede that point, it follows that we can never have a socialist government -- or even a socialist opposition -- ever again. Politics can never again be about conviction; it can never again be about candidates saying to voters "I believe in this because it's true, and I want you to believe it as well, and here's why." Politics will always be about candidates second guessing what The People believe, pretending that that is what they believe, and pretending to believe something else if The People change their mind. We know what The People think. The People have just voted to crash the British economy and break up the United Kingdom because they think that will magically make all the brown people go away. 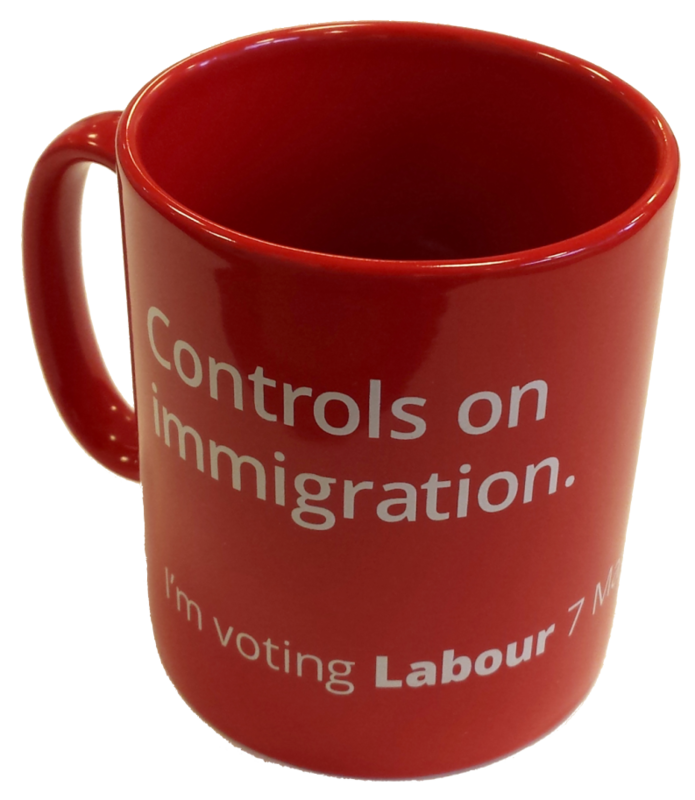 I don't think that it follows that Labour should start putting out anti-immigrant mugs and anti-immigrant tee shirts and start carving anti-immigrant slogans on chunks of marble in order to position themselves alongside the xenophobia brand. I think Labour needs to start telling The People that they are wrong about this one. I don't think that The People are stupid or evil. I think that The People are mostly not very interested in politics so if you keep on telling them the same story over and over again for long enough they'll end up sort of kind of assuming that it's true. So someone has to start telling them a different story. 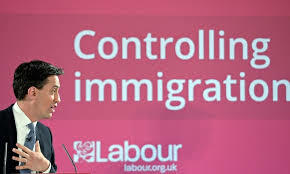 Someone has to use every tool of propaganda and advertising and rhetoric to say "It isn’t the immigrants that are making you poor, you chumps, it’s the Tories and their economic policies." Right now, The People would not elect a socialist prime minister. OK. But how would it be if the Left stopped fighting among themselves and started to make out a case for socialism. When did we last try that? This is the last throw of the dice. If we lose this one, then no-one will make the case for socialism again in my lifetime, and I and thousands like me will simply be excluded from the political discourse. Jeremy Corbyn is not the best standard bearer socialism could possibly have. But he is the best one currently on offer. And he does have conviction and moral authority and authenticity and a funny kind of charisma and he speaks from the heart. I really did see young people pushing their way to the front of the crowd to have their picture taken with him. How much do I like him? Seven and half out of ten. Baby steps. First, a socialist leader. Then, a socialist opposition. Then, a socialist prime minister. And then, of course, comes the tricky bit. (*) Not true, incidentally. Hattersley meant that Corbyn received plurality, but not an overall majority, of votes from Labour Party members, disregarding registered supports and Union affiliates: 49.59% of the votes. But it by no means follows that the remaining 50.41% were deeply opposed to his policies. Many of them will have had him as their second or third preference; and many more will have said "I agree with Jeremy Corbyn's policies, but I don't think that he has what it takes to be party leader." 2: The author acknowledges that this article will annoy all sides of the argument equually. On the plus side, think how much writing he'll be able to do when all his friends have stopped talking to him. 3: The author acknowledges that this article was abandoned before Anyone-But-Corbyn's big speech, and is therefore already out of date. 4: The author acknowledges that the court will give its judgement in about an a hour and a half, very probably making the whole question moot. 5: The author acknowledges that he stole this joke from David Eggers. 6: The author thanks bloggist, musician and dinosaur discoverer Mike Taylor for doing the Ditko mash-up. 7: Oh, and the title is a head-nod to Francis Spufford. If you haven't read his book then you ought to. This blog is supported by my Patreon backers. If you like what I write, you agree to pay £1 every time I write something. It's a good socialist principal. Like the Hulk, the Lizard wears purple trousers after his transformation; although unlike the Hulk, this appears to be the sartorial choice of his human counterpart. On the cover, the Lizard’s white lab coat is also purple — either due to an error, or because red/blue green/purple is a good combination in cheap four colour printing. The Lizard appears to have no teeth. Connors’s son Billy definitely knows about his father's affliction; although when the Lizard returns in issues #44, he appears not to. Amazing Spider-Man #4 (Sandman) seemed to have nailed the Spider-Man formula: it achieved a perfect equilibrium between The Writer (who wanted big fights between the Hero and a monthly Challenger) and The Artist (who wanted realistic stories of a guy saddled with weird powers). It interleaved the high-school story and the super-villain story and made the Fight Scene interesting by showing us the goodie and the baddie using their powers in a series of ingenious attacks, defenses and counter-attacks. But it appears that neither Lee nor Ditko quite realized they’d produced the definitive Spider-Man tale. Issue #5 and issue #6 represents a different conjectures about what a Spider-Man story ought to look like. Neither of them quite work. Comic book Science is a form of sympathetic magic, so the idea that a Potion brewed from lizards gives you new arms and legs but also turns you into an actual lizard makes a good deal of comic book sense. Harder to swallow is the alchemy of "powers". It seems that individual species — and indeed whole taxonomic categories — have irreducible essences which can be transubstantiated to other individuals. So the radioactive spider-bite transferred the "powers" of the Spiders to Peter Parker; and the lizard potion transferred the "powers" of all cold blooded creatures on earth to Curtis Connors. 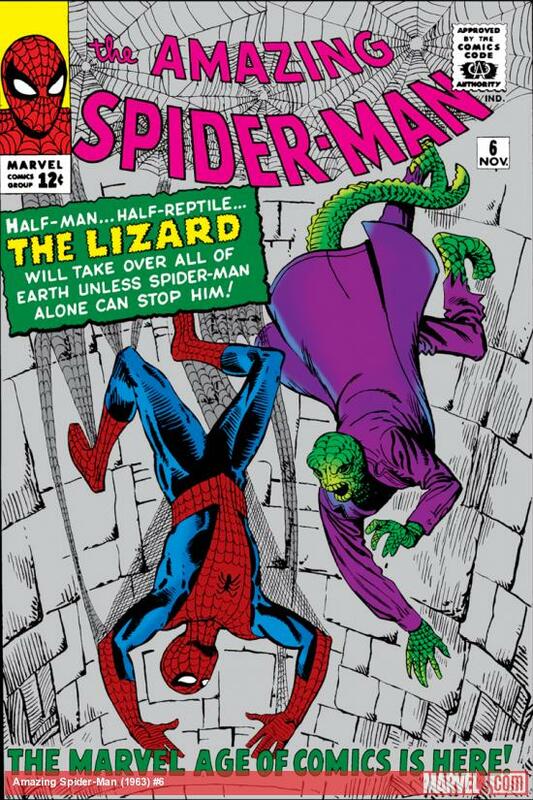 On page 16 we see Spider-Man using his wall-crawling ability to run up the side of an old Spanish fort, and The Lizard climbing after him. It looks to me as if The Lizard is just scaling the wall (picking out foot and hand holes in the brick work) but in fact, it’s all to do with his Platonic essence. “Hah! He forgets there are thousands of different kinds of lizards on the earth, and I have the powers of ALL of them! Has he never seen a gecko lizard slither up a wall”. Similarly, the Scorpion is able to cut through spider-webbing with his fingers because he has the “powers” of a scorpion and scorpions have claws; the Sub-Mariner is able to electrify his body because he has the “powers” of all fish and they serve eels in sea-food restaurants. The whole logic of the story depends on there being something unnatural or uncanny about The Lizard. Peter Parker has little difficulty in accepting the existence of space aliens, flaming teenagers or giant green monsters, but he finds the story of an intelligent lizard in a swamp a little too far-fetched. Jameson says outright that The Lizard doesn’t exist despite Parker having taken photos of it. Connors den is decked out with retort stands and test tubes; and he himself (even in his monster form) wears a long white lab coat. Spider-Man (being at least half way through his chemistry A level) is able to decode his notes and brew up a new Potion which turns The Lizard back into a human being. But no-one regards Connors as anything other than a black magician. “I tampered with forces of nature which must not be tampered with!” he exclaims, before burning his books and breaking his staff. Well, burning his books, anyway. It's not that his experiment had an unexpected result, or that he stupidly didn't think through the consequences: the idea of using Science to restore lost limbs was against the natural order of things. Like picking apples in Eden or trying to steal fire from the gods. Frankenstein was a necromancer. The bulk of the episode — pages 6 - 20 — takes Spider-Man out of New York altogether, sending him to Florida to fight The Lizard. It’s hard not to see this as a last-ditch attempt by Lee to force Ditko to turn in a superhero comic. Lee probably reasoned that Ditko couldn't very well fill the comic with characterization and human interest if Liz Allen, Aunt May, Flash Thompson Betty Brant and Spider-Man are a thousand miles apart. J. Jonah Jameson, on the other hand, flies all the way to Florida with Peter Parker ("It’s such a big story that I’m going with you”), confirming our sense that Amazing Spider-Man has become the Peter and Jonah Show. This is the third consecutive episode which has begun with J.J.J bad-mouthing our hero. It's a potentially good set-up for a story: how many sit-com episodes have involved sending two characters who don’t like each other away on a field trip? But, as so often in these early issues, nothing really comes of it. We ought to have seen Parker and Jameson forced to make conversation in a hotel room during a power cut, or Spider-Man and J.J.J. forced to cooperate to escape from the Lizard. In fact, Jameson might just as well have stayed at home: Peter gives him the slip as soon as they arrive in Florida, and the remaining 12 pages is a monster story in which Spider-Man doesn't get out of costume once. Ditko does manages to smuggle a bit of soap-opera in, a 4 page sequence in which Peter Parker goes to the museum to find out about lizards and finds Flash and Liz already there. (Museums are a sort of olden days version of Google.) Wouldn’t you know it, though: some thieves try to rob the museum and briefly take Liz hostage. Peter has to change to Spider-Man to rescue her. This sequence has no actual connection with the main plot, and it’s very hard not to think that Ditko dropped it in as a pretext for reminding us readers that the supporting cast still exist. As we've seen, Stan Lee’s dialogue and captions sometimes get out of sync with Steve Ditko’s art. There is a minor example of that in the museum sequence: we see two hoods walking through the dinosaur exhibition; Peter Parker clocking them with his spider-sense; the crooks spotting that he’s spotted them and grabbing Liz at gunpoint; and Spider-Man knocking them both out with a single punch. (”Ugh! Oof!”). Nothing in the pictures indicates what they are doing in the museum: for that, we have to read the speech bubbles. The crooks say “No-one saw us take the idol’s ruby”; a few panels later Spider-Man says “It’s the guard! He’s chasing those two! He saw them steal something!” and the crooks say “Okay, so you saw us grab that ruby…”. 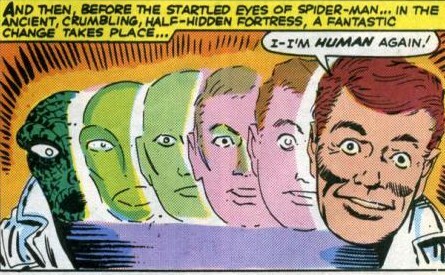 It’s very odd that we don’t see the idol or the theft; and very odd that Ditko doesn’t show us the crooks trying to conceal a gem. It’s very odd indeed that Spider-Man says that he sees guardS chasing them, even though there is no guard in the picture. It is pretty clear that Stan Lee looked at the pictures, didn’t think it was clear what was going on (which, indeed, it isn’t) and made up the story about the jewel heist after the event. But this is as nothing to the counter melody that Lee plays during Spider-Man's big fight with The Lizard. The plot, as expressed in the pictures, is simple and satisfactory. The Lizard is terrorizing the Swamp. 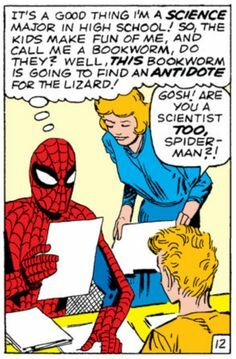 Spider-Man realizes that The Lizard and Curt Connors are the same person; and uses Science to make a potion that will turn him back to his human form. The challenge is how to get The Lizard to drink the potion, which Spider-Man ingeniously solves by grabbing The Lizard and forcing it down his throat. Spider-Man doesn’t hand Connors over to the authorities because he hasn’t broken any laws. Breaking the law is a big thing for Stan Lee. He keeps saying Doctor Doom isn’t really a baddie because there is no law against trying to conquer the universe. Surely the real point is that Spider-Man lets Connors go because he isn’t responsible for what he did when he was in his lizardy form? This doesn’t seem to be exciting enough for Lee so he adds a sub plot. During the big fight, The Lizard is shown to be being followed around by three big alligators. I don't think that you or I, just looking at the picture, would have thought that needed much explanation: of course a big intelligent humanoid lizard would have alligators as minions. But Lee feels the need to explain that the Lizard Potion not only turned Connors into a Lizard; not only gave him the Powers of every kind of Lizard; but also gave him mental control over Lizards. Even better, he is going to spill his Potion into the swamp, which will turn every lizard in the world into a super-lizard under his mental command which will enable him to (Evil Laughter) RULE THE WORLD! I suppose this follows on a bit from the “alchemical” idea that Connors' has transferred some kind of distilled essence of lizardyness to himself. I suppose that Stan Lee thinks that increasing the “hazard” automatically makes the story more exciting, so he upgrades “I have to defeat the monster and return the nice scientist to his right mind” to “I have to defeat the monster and return Connors to his right mind or else he will conquer the world.” I think it is unnecessary, and confuses a simple story. None of the pictures remotely suggest the conquer-the-world angle. Ditko shows us Spider-Man physically snapping photos with his camera; and clearly shows Spider-Man holding a flask with the antidote Potion in it. But at no point do we see The Lizard's conquer-the-world Potion. 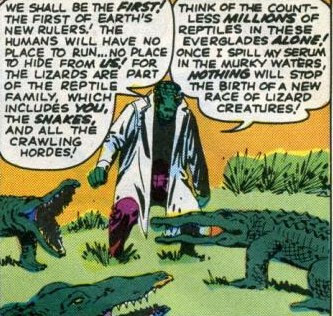 Surely if Ditko had known about it, there would have been a dramatic scene with the Lizard holding a flask over the swamp and Spider-Man grabbing it in the nick of time? Once again, Spider-Man is not primarily motivated by a sense of duty or altruism. He goes to Florida because Jameson challenges him to fight the Lizard (as Spider-Man) and because he needs the money for the photo-assignment (as Peter Parker). Once again, he starts out acting from honest self-interest and only gradually becomes entwined in situation in which he has to a good thing. Spider-Man initially thinks that The Lizard is “publicity mad”; where Jameson thinks that Spider-Man will not challenge him because he is more interested in “making a rep” for himself in New York. But when Peter Parker comes up with the pictures, Jameson (having traveled all the way to Florida to get them) declares that the whole thing is “some sort of publicity stunt” and refuses to pay for them. Once again, we appear to be talking about competing sports stars or TV personalities, not heroes and deadly menaces. Issue #6 - Fails to sell pictures of Lizard. Does Aunt May have an independent source of income? What, indeed, was Uncle Ben’s job? Did he have a pension? May has no savings, having to pawn her jewelry to pay the rent in issue #2. Having spent all the money from issue #2 on rent and kitchen equipment, are May and Peter wholly reliant on the Sandman pictures to pay general living expenses? If so, how can Parker even contemplate college? On page 6, Parker nervously tells Betty Brant “I’ve been wanting to ASK you something.” We can guess what he wants to ask her: after all, only last issue he suddenly realized how he felt about her. On his return from Florida, he phones her up -- at some point in the last year, he has grown into the kind of guy who confidently asks girls to go out with him. But when he finds out she’s working late, he immediately asks Liz to go out with him instead. Which, if he’s honestly just realized that Betty is seriously interested in him and he’s seriously interested in her is a fairly caddish thing to do. The grim tragedy of Stan Lee’s groundbreaking character has become a comic tick. You can almost hear the waa-waa-waa sound effect in the background. We have four or five months of happy endings to look forward to before everything turns depressing again. This kind of thing makes me raise my voice, roll my eyes and use dismissive body language. I trust you can personally guarantee it won't happen again this time around? First use of a pre-existing villain. You’ve struggled through one of the LONGEST INTRODUCTIONS you’ve ever read! But we think you’ll find it well worth it because now the fireworks begin in earnest! And now settle back and prepare to witness the gol-dangest, ding bustedest, rip-snoting’est super characters fight you’ve ever seen! And there you have it: half way through the fifth issue of Spider-Man — arguably before the character is fully formed — we see the crack that three years from now will bring the first great era of the comic to its end. Even if you knew nothing about the off-stage disagreements between Lee and Ditko it would be obvious that there were two competing voices in this comic. The narrator-voice, the person who speaks the captions, is somehow outside the story: commenting on it as it unfolds, not creating it. And this narrator-voice is impatient with the back-story and wishes we could fast forward to the fight scene. The story-teller, on the other hand, wants to linger in the set-up and show us why the fight happened. Put another way: the narrator is only interested in the Spider-Man part of the tale; the story teller is interested in Peter Parker as well. Put a third way: the narrator thinks it's a fantasy book about super-villains; the story teller thinks it's a realistic book about an ordinary guy coping with his weird powers. Now, this may be a calculated part of the act. Stan Lee takes the mickey our of Art Simek on nearly every credits page, but no-one seriously thinks there was a rift between the writer and the lettering department. But knowing what we know, I think that Stan Lee is editorializing. I think he really does think that Ditko has spent too long on the sub-plot about Peter Parker and Flash Thompson, and is actively criticizing him, right there, on the pages of the published comic. Stan Lee's complaint about the long build up isn't particularly valid. The comic is extremely well structured: a two page set up; four pages of Spider-Man’s first meeting with Doom; a four page interlude; a second, eight page fight; and a two page wrap up. I think most readers would take the opposite line: the set up is really well done and funny, but it doesn't go anywhere: instead of a payoff, we get an eight page wrestling match. The story has two prongs. In Prong A, Doctor Doom becomes interested in Spider-Man. First of all, he decides to ask Spider-Man to help him defeat the Fantastic Four. (After all, if he nearly beat them by himself, he should be able to beat them easily with the help of a teenager who can stick to walls.) Doom makes no attempt to deceive Spider-Man (as he does with the Silver Surfer a couple of years later) but appeals directly to his vanity. As ever, fame is the bait, and being a superhero is a branch of showbiz. “And yet, right under your nose, the Fantastic Four bask in the limelight while you are shunned and hunted.” ("Limelight” is pretty much a synonym for Spotlight: it was the title of of Charlie Chaplin’s last film, about the tragedy of fame.) And astonishingly, Spider-Man is momentarily tempted by the idea: “Me team up with you, huh. Wouldn’t that be a gasser!” Spider-Man is still a morally ambiguous character: he does, in fact, make the right decisions, but maybe one day he won't. He doesn’t say “get thee behind me supervillain, for I have sworneth on my uncle’s grave always to support the forces of good”. 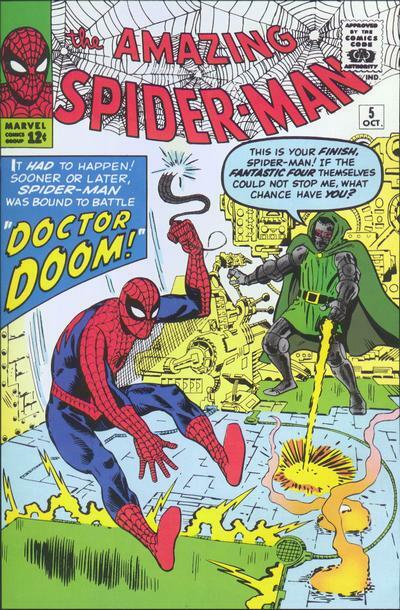 He says “Sure, it’s an amusing thought to kick around…” Teaming up with Doctor Doom? Amusing? When he has turned down the idea of going into partnership with the world's worst supervillain, Doom decides to capture Spider-Man and hold him hostage — telling the Fantastic Four that Spider-Man will die if they don’t surrender to him. This makes literally no sense whatsoever. If Doom wants a hostage, why pick on someone who is difficult to capture and who the Fantastic Four have no particular commitment to? Why not just capture Will Lumpkin the postman? This brings us to Prong B. Flash Thompson decides to play a prank on Peter Parker — dressing up as Spider-Man and jumping out on him to scare him. In a rather brilliantly timed denouement, Peter Parker and Flash Thompson are walking on opposite sides of a fence while Doom is scanning the area with his Spider-Man Detector. So Doom thinks he has captured Spider-Man, but has actually captured Flash Thompson in a Spider-Man suit. This is an almost perfect example of the accommodation that the story-teller will reach with the narrator: in almost every episode from now on, some unlikely co-incidence will bring an incident from Peter Parker's life and a threat to Spider-Man crashing together. But on this occasion, not very much comes of the set up. 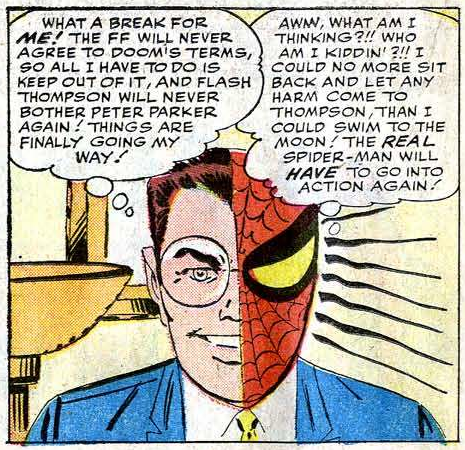 I wish Doom had continued to believe, or pretend to believe, that Thompson was Spider-Man for much longer; or that there had been a funnier confrontation between the real Spider-Man and the fake one; or Thompson had somehow found the Master Control Switch and really saved the day. When Peter hears that Doom has captured Thompson by mistake, our Responsibility Hero’s first reaction is…to do nothing: to let Doom kill him, and actually to gloat about it. He appears to have momentarily metamorphosed into Evil Genius Parker (with extra-large glasses) “What a break for me! All I have to do is keep out of it and Flash Thompson will never bother Peter Parker again! Finally, things are going my way!” (Flash certainly does call Peter bad names; but Peter calls Flash bad names in return. Wanting him to be murdered is a fairly extreme over-reaction.) But of course, the other side of Parker, the Spider-Man side, responds “Awww, what am I thinking? Who am I kidding?” Note that Peter Parker's better angels do not say that "just keeping out of it" is precisely what got Uncle Ben killed: they just say that letting Flash die is not the sort of thing Parker would ever do. 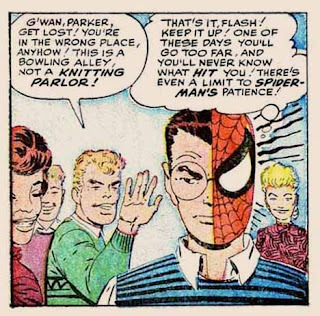 This is the third time that the split Parker / Spider-Man face has been used in the context of Parker’s relationship with Thompson. At the end of last issue, Parker momentarily morphed into a super-villain and threatened to punch Flash ("you have insulted me for the last time!”); but his Spider-Man half reminded him that if he had a fight with a non-superpowered person, he could easily kill them. At the beginning of this issue, Flash taunts Peter again ("this is a bowling alley, not a knitting parlour”) and the Spider-Man side of Peter's face thinks that one day, he will lose control and Flash won’t know what hit him. So Spider-Man is both the potential that Peter Parker might do a bad thing — he is so strong, that his strength must be kept in check at all times. But Spider-Man is also Peter Parker’s moral side: the side which tells him that he can’t stand by and let villains kill civilians — even footballers. The idea that a strong man has to be a saint because he has so much potential to harm people recalls Sir Lancelot in the Once and Future King; it's one of the central moral ideas in Marvel Comics, eventually daubed across the universe in the Dark Phoenix saga. ("I’d have to stay completely in control of myself every second of every day for the rest of my immortal life. Maybe I could do it. But if slipped, even for an instant, if I… failed… if even one more person died at my hands…")I can't think of any occasion when Spider-Man does cause harm by losing control: his sins are invariably sins of omission. These intertitles may seem redundant to the modern reader: if the last panel on page 3 shows Doctor Doom in his lair, and the first panel on page 4 shows Spider-Man in his bedroom, we can infer a shift of location without it being signaled by a "Meanwhile, at home..." But I don’t think that comic book writers could assume that level of visual literacy in 1963. Stan Lee felt the need to point out that Peter Parker didn't really have lines coming out of his head when he used his spider-sense, it was just a way of making the picture look more dramatic. TV shows of the period are very reluctant to cut from, say, the surface of the alien planet to the bridge of the Starship Enterprise without an establishing shot of the ship or the planet to tell the viewers where they are. But does Ditko really intend that Peter dropped into the Bugle on a Sunday to tell them that he doesn’t have anything to sell them; and that he found both the editor in chief and his PA in the building? In fact, panel 5 on page 21 clearly follows directly from panel 4: while he’s at the office, Betty says that Peter is wonderful, and he is still thinking “gosh, I never realised she felt that way about me” when he gets to school. (Note that he is wearing the same clothes in the two panels. Ditko cares about that sort of thing. : Peter is dressed informally in the bowling alley but in his normal yellow tie when he visits the Bugle the next morning.) We could treat this as a simple mistake, and replace “the next day…” with “later that day…” but that means that Peter has to go to school on a Sunday. We could say that the kids were at the bowling alley on a Saturday, but that means that Peter sold J.J.J. the pictures of the fire on a Sunday. 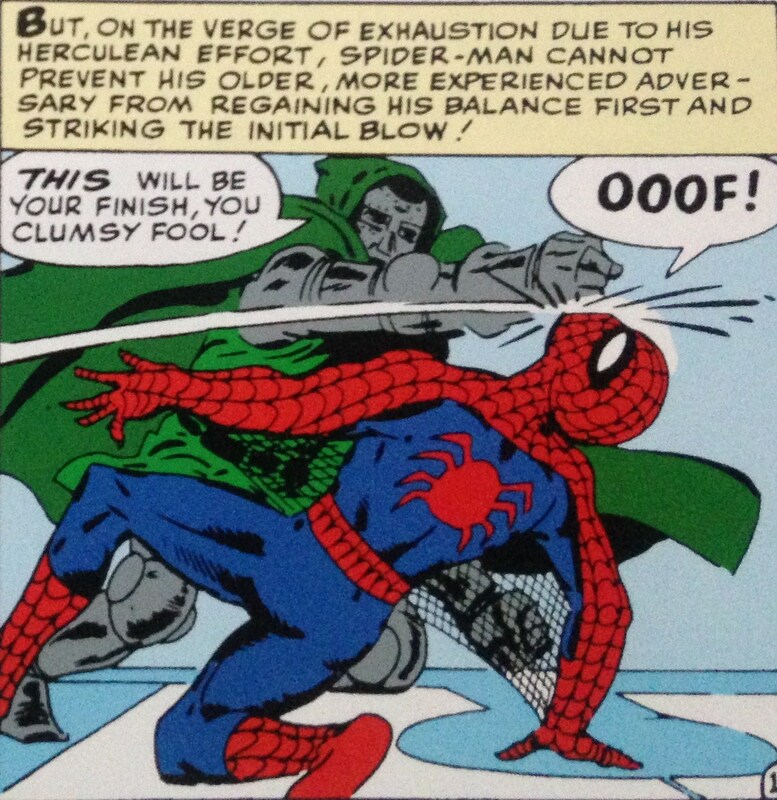 It doesn’t help that Doom is surprised to see Spider-Man walking about "in broad daylight", but that “a short time later” Aunt May’s house is plunged into darkness when the fuses blow! 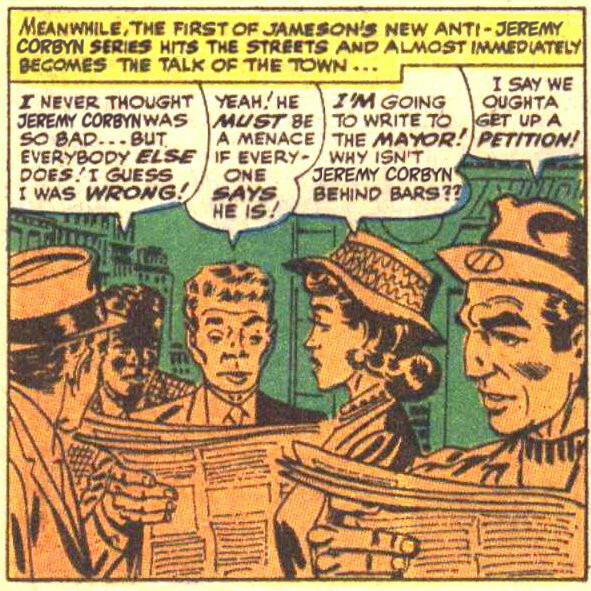 There are seven day a week newspapers, of course, and it is possible that Jameson never gives Betty any time off. It is possible that Peter Parker knows what hours Betty works and happens to drop in when he knows she'll be there. But Stan Lee doesn’t have any chronology in his head: “Next day…” is simply a bit of scene shifting noise. It would be an interesting exercise to change every time-based caption to “Immediately…” and see if it had any effect on the story. A third category of caption is narrative description. These seem to be almost entirely indefensible: why on earth would we need to be told that two mighty foes are battling for their lives over a picture of two mighty foes battling for their lives? It's almost as if Narrator Guy feels the need to pop up from time to time and say "Hello! I'm still here!" 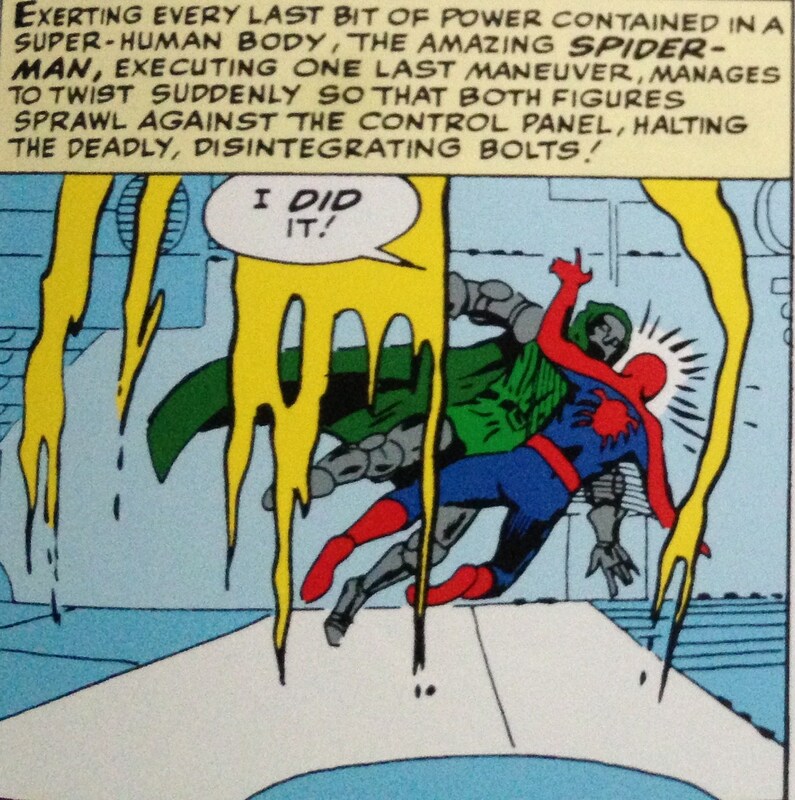 Over three panels, Doom tries to push Spider-Man into the path of the death ray; Spider-Man pushes Doom back ("I did it!") but Doom punches him ("Oof"). It is not a particularly inspired sequence; and it isn’t clear from the pictures what happens to the death-ray device. Exerting every last bit of power contained in a super-human body, the Amazing Spider-Man, executing one last maneuver, manages to twist suddenly so that both figures sprawl against the control panel, halting the deadly, disintegrating bolts! 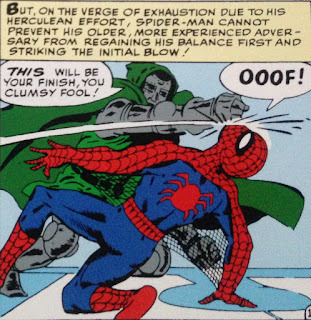 But on the verge of exhaustion due to his herculean effort, Spider-Man cannot prevent his older, more experienced adversary from regaining his balance first and striking the initial blow! 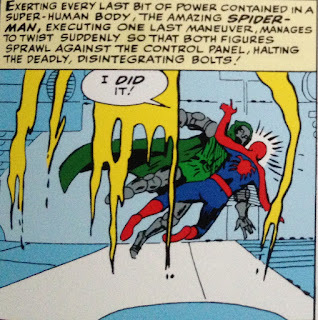 Spider-Man twists suddenly so that he and Doom fall against the control panel. Ditko has just given us 12 panels of Doom and Spider-Man hitting each other, with a weird “war of the worlds” floaty-thing firing death rays at Spider-Man. A page later, the fight just peters out: the Fantastic Four arrive and Doctor Doom runs away. This isn't a very satisfactory way for a wrestling match to end. So Lee creates a climax for the fight, using many words to convince us something important has happened. Nothing in the pictures suggest that Spider-Man is making a big effort. Nothing in the pictures suggests that he pushes Doom against the control panel. And nothing in the rest of the story suggests that Spider-Man is particularly exhausted. The words are, if anything, a counter-melody to the pictures. Up to now, Spider-Man has beaten villains with Science; because Peter Parker has thought up devices to stop their arms or their wings working. But this time Spider-Man wins because he tries super hard and doesn't give up. (Maybe he's remembering the Human Torch's motivational talk!) He has super-strength; but he is operating at the very limit of that strength. So it doesn’t matter that the F.F turn up and Doom escapes, or even that Flash Thompson will take the credit for scaring Doom away. Spider-Man has won a moral victory by continuing to push when he was practically exhausted. And it is astonishing to see this happening in the space between the panels. Because there is going to come another day on which Spider-Man will have to exert an herculean effort; and another time when he will cry out “I did it!” And that will also be the day when the crack between the Story Teller and the Narrator brings the whole edifice crashing down. If you have enjoyed this essay, please support me on Patreon.